Bridge of Allan Sports Club’s Rowan Niven is a national champion after victory at the 2019 Joma Scottish Junior National Championships in Aberdeen on Sunday. 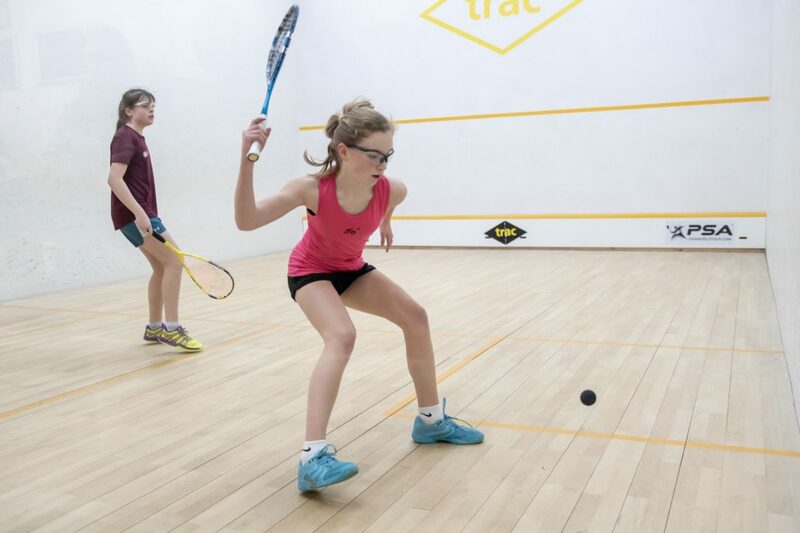 The 13-year-old won the GU15 title at Aberdeen Squash & Racketball Club, which once again provided a fitting venue for Scotland’s juniors to showcase their talents over the weekend. Rowan (2) defeated close friend and top seed Anna Halliday 11-6, 5-11, 12-10, 11-7 to win the title. 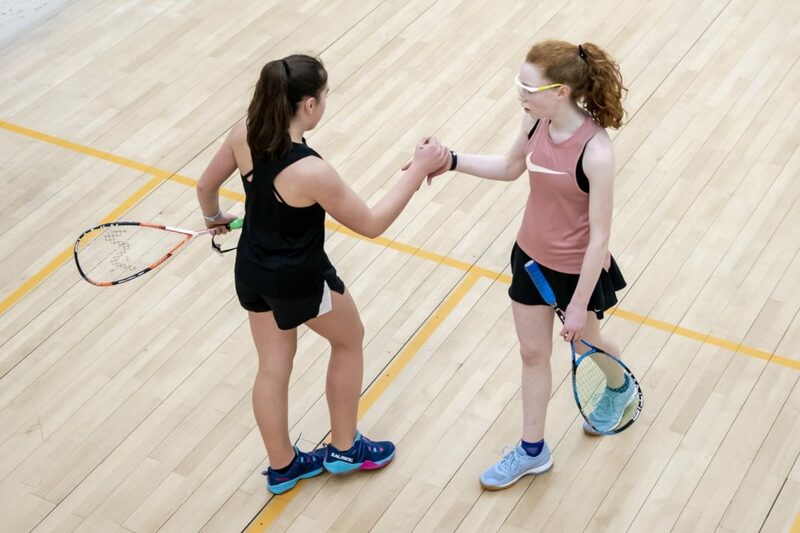 The result was a reverse of last year’s GU13 gold medal match between the pair which Anna prevailed in and Rowan, below, was delighted to get the better of her friend this time. She said: “It felt amazing and was a great moment for me. “I was really happy because it’s the first time in about three or four years I’ve beaten her. “Anna and I are really close. We have been friends since we were two-years-old and have been competing since Primary School. She added: “I have been practicing every day since Christmas. 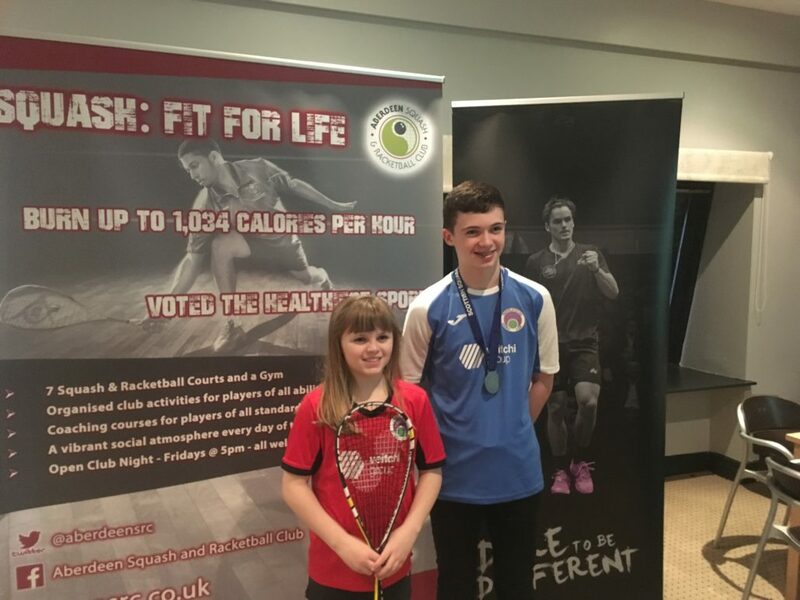 In the round-robin GU15 event, Jessica Shaw produced some fine squash to claim the silver medal after just one defeat, with Anna Halliday winning bronze. Robyn McAlpine sealed her first national title courtesy of victory over her West teammate Louisa Kaven, both pictured below. Robyn came from one game down in Sunday’s GU13 final to win in four, 8-11, 11-5, 11-5, 11-8. The 12-year-old was third in the same event last year and was delighted to win gold in 2019. “I was really happy with the result,” she said. “I’ve been playing for about two years and I think I have come on really well. “Winning a first national title feels great and it was a hard match against Louisa who I have played a couple of times recently. “It was quite stressful because she won the first game and after that I tried to take my time and take pace off the ball so it wasn’t coming off the back wall so much. Orla McDougall won bronze in the third/fourth play-off beating Florence Gibson in a thrilling five game match, 11-5, 6-11, 11-7, 9-11, 11-7. In the GU17 event, Lucy Murchie successfully defended her title to make it a third national crown for the Crieff youngster. 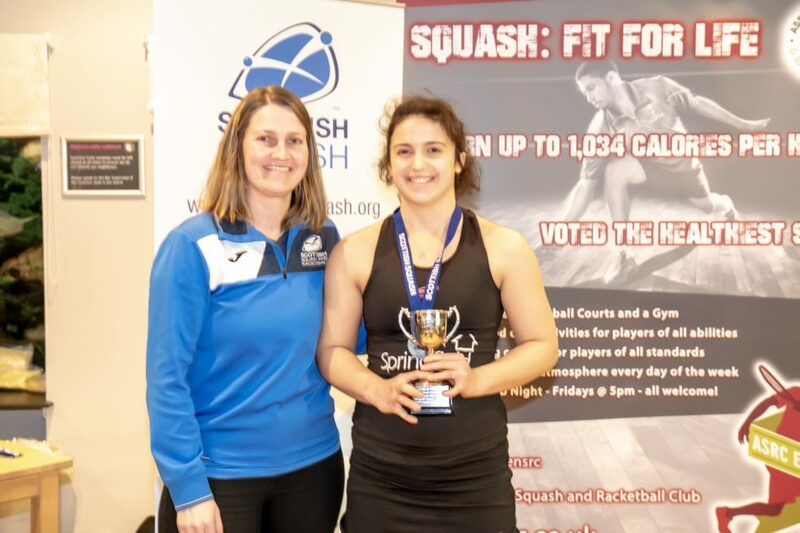 She won her final against Beth Moglia off the back of a long match in the GU19 competition where she defeated Orla Young in five games which helped Lucy seal U19 silver. Lucy defeated Beth 11-4, 9-11, 11-7, 11-9. 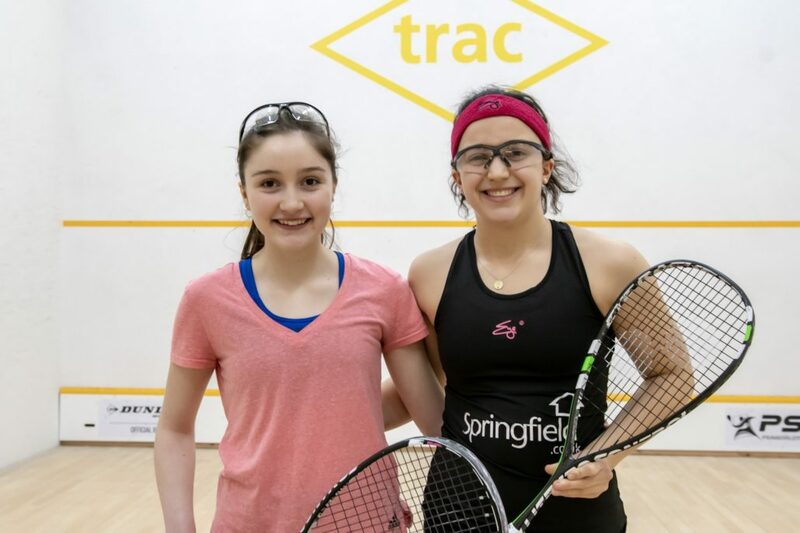 After the GU17 final, she said: “The long match before the final took it out of me but it meant I felt less pressure because I didn’t have too much time to think about things. 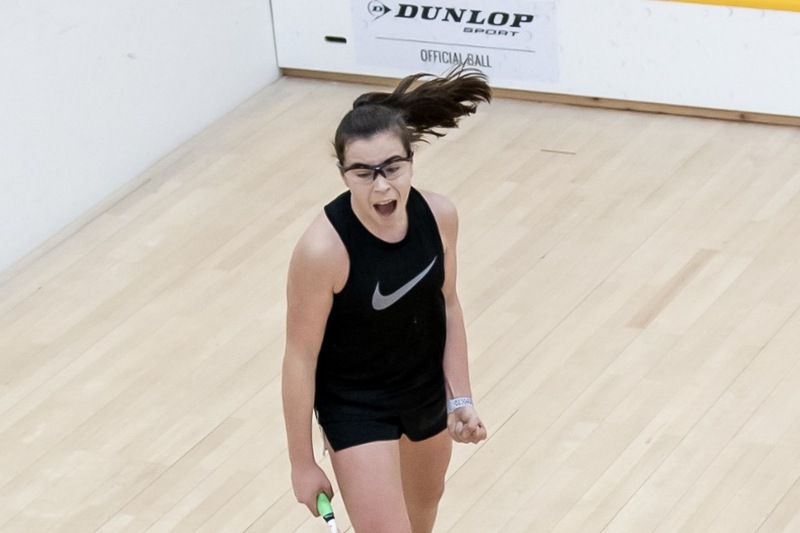 The 15-year-old added: “With my coach I’ve been working on my volleying and upping my pace a bit more and it was good to see these improvements on court both here and at the Scottish Junior Open where I played quite well. Top seed Orla Young, below with Georgia Adderley, sealed GU17 bronze thanks to a win over Ellis Miller 11-7, 7-11, 11-9, 11-7 to go with her bronze medal in the GU19 competition. 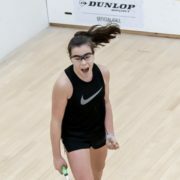 Two-time British Junior National Champion Georgia Adderley won the GU19 round-robin event to make it a fourth National Junior title before her full-time move into the Seniors. Georgia came into the competition having performed impressively at the Edinburgh Open last week where she earned a wildcard. She beat Chloe Mesic from France in a marathon match lasting 62 minutes 11-7, 11-8, 6-11, 10-12, 11-4 before bowing out in R2 against world number 55 Olivia Fiechter (USA), 11-8, 11-2, 12-10 on Thursday. 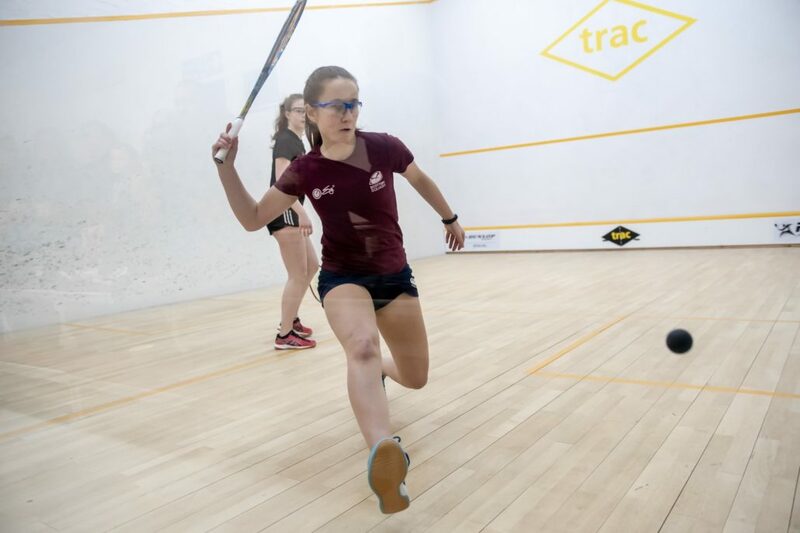 It meant a quick turnaround for the 18-year-old who played her opening GU19 match on Friday beating Lucy Murchie in three games. Top seed Georgia won all four of her matches over the weekend in straight games to seal another title. She said: “I came in pretty tired after the Edinburgh Open but was really happy with the way I performed. “I have been working on pushing up the court, taking the ball earlier to take advantage of my speed. She continued: “The Junior Nationals was another fantastic event and it was great to see so many girls playing here in Aberdeen. Meanwhile, Merryn Penman, below with brother Kyle, underlined her exciting potential once again by retaining her GU11 title. The youngster went unbeaten throughout the weekend to fully justify her top seed status, dropping just two games in four matches. 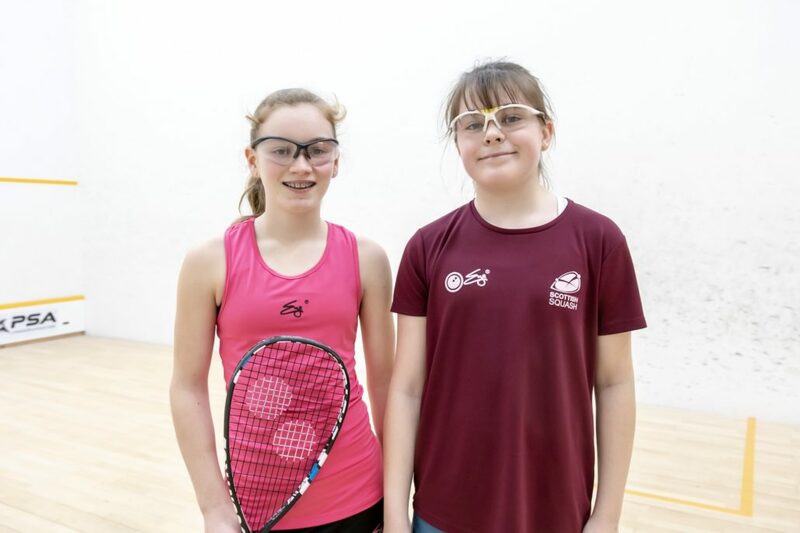 The stand-out win was over the talented Ella Bannister on Saturday morning with Merryn winning an epic clash on showcourt seven 16-14, 11-8, 8-11, 6-11, 11-3. Ella won silver in the event with Isla Cargill winning bronze to go with her silver last year. For all results and placings, click here. Read the Boys’ report here. 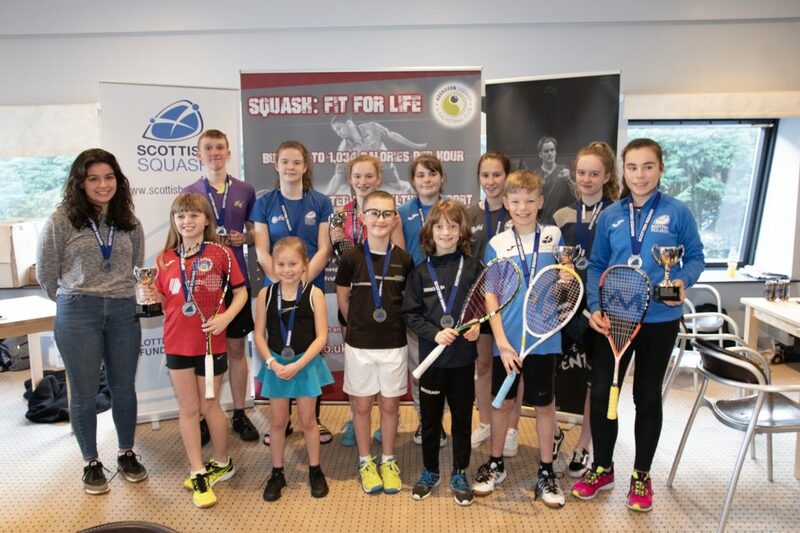 Scottish Squash would like to thank Aberdeen Squash and Racketball Club for helping deliver another successful event as well as headline sponsor Joma Sports and event partner Eye Rackets.